Select the Certificate that you would like to view. Each of our certificates have been digitally restored from documents that date back as far as the mid 1800’s. 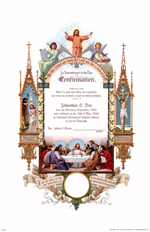 After restoration and repair the certificates are printed on high quality, heavy bond, 8.5″x11″ & 11”x17’, 100% Rag, Acid Free paper. We also provide fully Customized versions of each certificate with the recipients name, event location and other pertinent information printed directly into the document. This helps make each document unique to the individual receiving it.